The setting of two bedroom Villa UJV 230 captures your fantasy of a tropical island paradise. Located in prestigious Pointe Milou, St. Barths, Villa UJV 230 is a tiny jewel that offers qualities rarely found together in one location in St. Barth's: affordable prices in a highly sought-after district, inviting ocean views from three sides of the villa, an expansive deck and 13-meter heated pool that seems to end in the middle of the ocean - and no traffic noise. The only sound you hear is the breeze moving through the palm trees. In true island style, the house is open to the outside. It almost feels like a loft, with one area moving easily into another. The concept is to take full advantage of the ocean vistas and, in a compact space, to create options both indoors and outside for easy living - whether you are lounging, dining or bronzing. Making life comfortable at UJV 230 was the goal of the owners. The materials are simple, stylish and create a refreshing atmosphere. The materials include ash wood, a silver green resin floor throughout, a stainless steel kitchen, and white linens. The accessories, like jewelry, add character, including Christian Liaigre lamps, and Flos lighting. In addition to regularly changing the artwork, the owners always add new touches: glasses and coasters from Ibiza, placemats from Paris, cushion covers and baskets from Africa. The interior and exterior colors were custom created by Donald Kaufman and Taffy Dahl, who have designed colors for, among others, the Metropolitan Museum of Art in New York, the Delany Hotel in Miami and the J. Paul Getty Museum in Los Angeles. The white used, for instance, is a "dark" white that reflects less light, thus creating a "cooler" interior. There are two completely different living and dining areas. The main living room has a sink-in sofa, chaise and chairs in relaxed white duck fabric. A small office extends off the room with a huge sea view. The sunroom perfects that "outdoor feel indoors" with an 11ft. ceiling, couches long enough to stretch out your legs and a wonderful place for dining at a long wooden table. A few steps up, the kitchen/dining areas offers even more dramatic views. Everything you need is within reach. The stainless steel countertops and appliances gleam. Just next to the kitchen island, in its own space, the round white polyethylene table provides another cozy place to dine. The shade porch extends directly out from the kitchen/dining area. Its canvas awning and big outdoor bed invites you to curl up with a book - or just stare at the sea view. The bedroom and bathrooms (air-conditioned) are two equal master suites, with custom-designed king-size beds (Tempur-Pedic mattresses), closet units, and crisp white linens, creating a refreshing haven. Blackout curtains let you sleep late. Sliding doors open onto decks overlooking the ocean. The windows and doors have screens. Both of these bedrooms are non-smoking. The bathrooms have twin sinks, showers, and thick white towels. The options for outdoor living are plentiful. There are even three separate shaded outdoor spaces for people who love the sun, but want protection. Off the sunroom, there is a huge chair on a deck shaded by an awning. 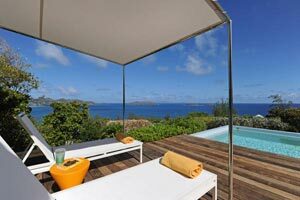 At the end of the pool, offering a wide sea view, an open cabana shades two chaises lounges. One level below the pool, on its own deck, is a wood frame gazebo with a palm frond roof. A table for four invites you to have breakfast "away" from the house, for example, or any meal, or sunset cocktails. At UJV 230, you will feel instantly at home. A two-minute drive takes you to a small supermarket and a 4-minute drive to the supermarkets and bakery in Lorient. The village of St. Jean is 5-7 minutes away and it is 12-minutes into Gustavia. The housekeeper and house manager can help with special requests. Short drive to all beaches.